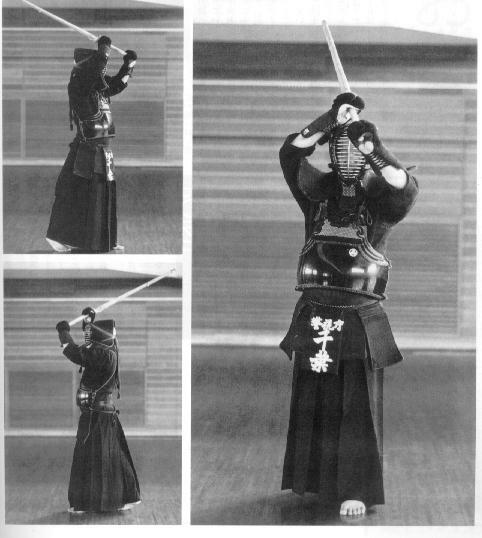 This page is dedicated for all kendoist who are interested in jodan no kamae. Sadly there aren’t too much information about it on the net. And it’s not easy to learn it especially outside of Japan. But if you search restlessly you may find one thing or two. I try to share here everything I’ve found till today. Please feel free to comment or give related links you know! 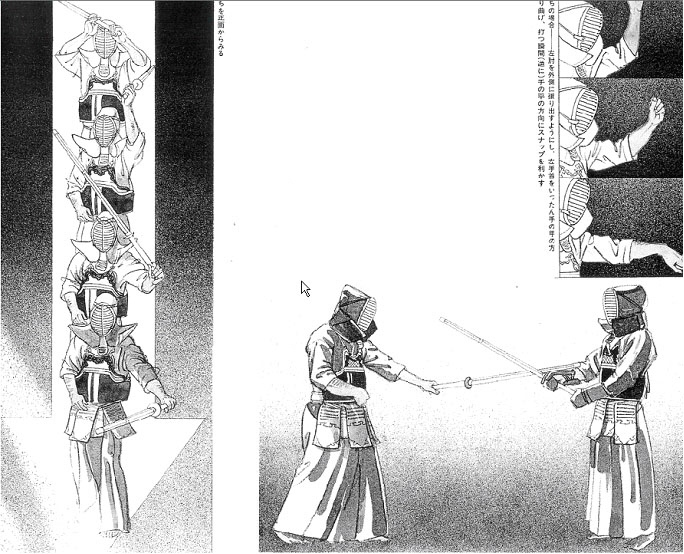 there is the concept of “Kurai wo takaku toru” or “Taking the high position” which is believed to be ideal for offense. 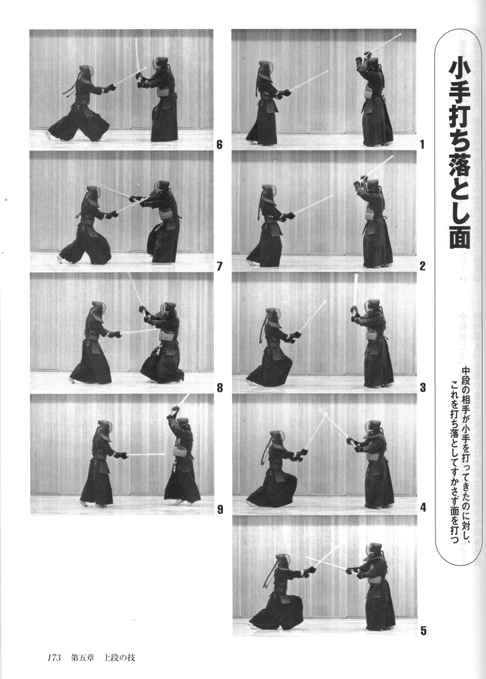 Similarly in Kendo, “Ten no Kurai”, the position of the heavens has been used for a long time. The primary feature of Jodan is that the position of the shinai is held up high, and the very strong striking power and potential that comes from this position. These aspects must be focused on. 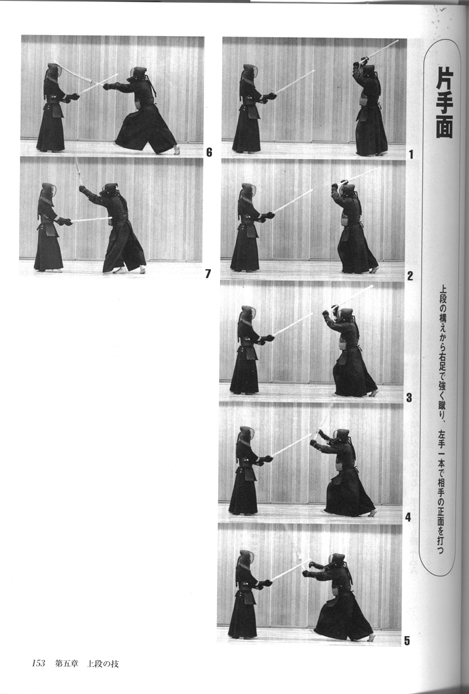 Iho Kiyotsugu’s “New Progress Course Kendo” 1982. I’m not sure why, but Gerry has asked me to write an article on Jodan. When I say that I am not sure why, it is because I don’t consider my self as an expert on the subject, yes I have been Jodan player for quite a few years now, with some success in tournaments, but I have never really had some one teach me it, in fact I learnt a lot of what I know from watching video tapes of Chiba Sensei at the all Japan championships. Over the past couple of years I have been lucky enough to meet and get some instruction from Yamanaka Sensei, Toda Sensei and Chiba Sensei all famous Japanese 8th Dan Jodan players whose knowledge on the subject I have only scratched the surface of. I should also mention Sumi Sensei (although not known for his Jodan, he did play Jodan when he was in high school), Mr Hirai from London and Walter from Mumashi. Anyway here goes, there is a lot said about having to adopt a different attitude when you decide to play Jodan, you have to be more imposing and arrogant, that you must never go backwards, these are all true to some extent but they are also true if you choose to play Chudan. If you step up in front of some one to practice, no matter which Kamae you choose to adopt you should always believe that you can beat them. Yes you should try to put pressure on your opponent by going forward, but there are also times when going backwards works to your advantage, you can lure your opponent in, you can avoid there strike or you can step back to regain your composure and posture (having said that, you should always try to maintain your composure and posture and keep your mind switched on through the practice, because if you lose any of the afore mentioned you will be showing weakness to your opponent and giving them the opportunity to strike you ), so to summarise this paragraph, it doesn’t matter which Kamae you choose to adopt, you should adopt the same attitude! Ok, down to the nitty-gritty. 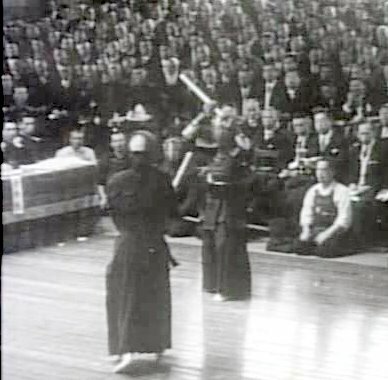 There are many ways to strike your opponent from Jodan, you can use Katate-Waza (single hand strike) or you can use both hands to cut with, you can even swap your hands over and strike Katate-Waza holding the Shinai in your right hand, but if you are thinking of trying Jodan stick to the orthodox method of using the left hand at the bottom of the Tsukagawa. As far as I know there are 3 main methods of performing Katate-Waza from Jodan, these are (and these are only my pet names for these techniques) 1: The Push, 2: The Pull and 3: The Whip The same posture and position of Shinai and Left hand applies to all of these the only difference is the position of the Right hand. First go into Jodan-no-kamai, raise your hands above your head and make sure your Left hand is positioned about a fists width away from your forehead and in line with your Left eye, your Right hand should be about a fists width behind your forehead with your thumb just brushing the top of your Men, try to keep you Shinai pointing at approx a 45 degree angle with the tip pointing up to the sky, if you all your shinai to become flat (i.e. : not pointing up to the sky) it will just slow down your cut and give your opponent the chance to deflect your cut. So now that you are in the proper Kamae it’s time to cut your opponent, I will start of by trying to describe the Push method. Your left hand should grip the Shinai very lightly at the base while you should just rest the shinai in your right hand, position it so that it rest in the V formed between your thumb and your first finger, keep the fingers of your right hand curled over but only lightly brushing the shiai. To start of with extend your left arm from the elbow and push the right hand forward this will accelerate the speed of your cut, as you perform this cut your right hand should loose contact with the shinai. As you let go with the right hand try to keep a very relaxed grip with the left hand and only grip tighter at the moment of impact. As you let go with the right hand bring it down swiftly to your right hip, this has 2 benefits, it adds to the speed of your cut and gets your hand out of danger. As you become more proficient at this, try to slide your right hand down the Tsukagawa at the same time as you push it forward, this will speed your cut up even further. Again grip the Shinai lightly in the left hand, this time with your right hand curly your fingers around the shinai, resting them on the blade side (i.e. : don’t take a full grip) with your right hand slightly pull back on the shinai while your left hand is slightly pushing forward, by exerting pressure in both directions you are creating a spring effect, so as when you want to strike, release the right hand and snap the left hand forward at your chosen target. Again as you release the right hand you should bring it sharply down to your right hip. The shinai loosely with this technique as all your speed is coming from your left hand and if you over grip, this will slow you down considerably. 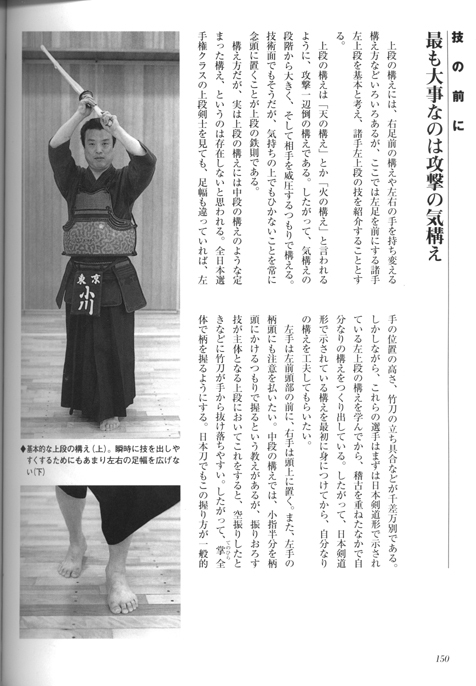 There is so much more to tell you about Jodan, but until you master cutting with one hand the rest would just over complicate things, maybe if Gerry wants I will go into things like Semi and Oji-waza in another article. My top tip for practicing Jodan is to do it sitting at home in your living room. Sit in sei-za in front of a sofa or chair and practice one of the methods of cutting that I have tried to describe. When you are practicing it is important not to over grip even at the point of impact, you will have more control over the shinai the more relaxed your grip is (I know that may sound stupid, most people think that if you grip strongly that you will be able to control the cut better at the point of impact, but believe me it is not true, a relaxed grip is the secret of good Jodan). 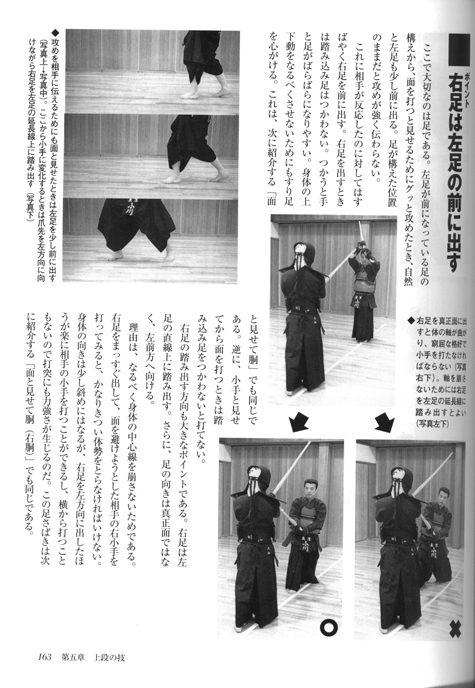 After the cut lands, your shinai should bounce back up so that it is almost vertical (especially if you are cutting Kote), to achieve this you flex your wrist back sharply after the cut by doing this you are affording your self some protection in case your opponent counter attack and it will also allow you to try a second technique. Having said this there are some occasions when you can follow through with your kote cut, but for now try practicing this one. any comments that you might have. Apart from the many hours of study in preparation for the final semester exams, I have been able to keep up with regular kendo training and daily gym routine most of the time. Earlier last week, I got the results of my mid-semester anatomy practical exam. I was really nervous as I scrolled down the result page to find my student number. I really did not think I did well after walking out from the laboratory on the exam day. However, upon seeing my score, I was so relieved… I came 4th in the year (out of 150 physio students). It is a much-needed confidence and motivation booster, especially when tomorrow is the first of my seven final exams in the next two weeks. Wish me good luck. I decide to take a study break now and write about the recent Sydney visit of Chiba Masashi Sensei, Kendo Hanshi 8 Dan and Oda Katsuo Sensei, Iaido Hanshi 8 Dan / Kendo Kyoshi 7 Dan. The Sydney kendo and iaido players were very fortunate to have these two prominent, well-respected sensei leading seminars on two evenings. And I was able to be the demonstration hitting dummy and receive Chiba Sensei’s snapping cuts with front-on view throughout the seminar. On top of that, I had the opportunities to accompany the two Sensei outside the dojo – to sightseeing, meals, etc…, thus was able to learn and listen to things that would not normally be possible to hear during the limited time inside the dojo. The “second dojo” as the two Sensei called it – allowed me to ask more questions, for the Sensei to explain the deeper aspects of kendo, to tell their stories of enduring training under harsh conditions, and ultimately climb to where they are at now. It was very inspirational to listen to the mind of the two great Sensei. In this parable, the Indian was sitting quietly on the ground. An American passed by and asked the Indian what he was doing. The Indian replied that he was quietly waiting there so that the soul that he had left behind could catch up to where he is . The moral of the story was that, we often forget our origin as we move on in our life. No matter how much has changed, we must not forget our origin. 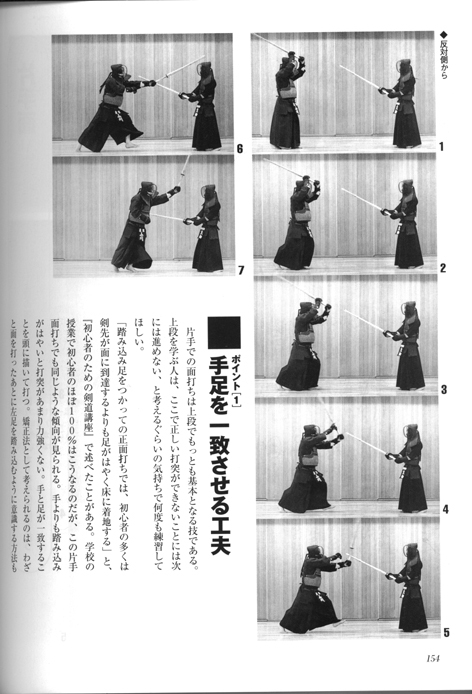 You may ask how does this apply in kendo? 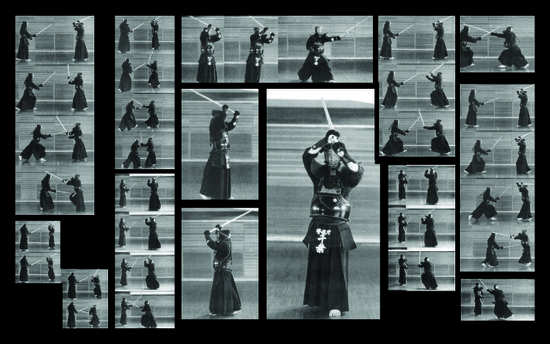 Through our kendo study, we receive help from many different people – our Sensei, Sempai and peers. 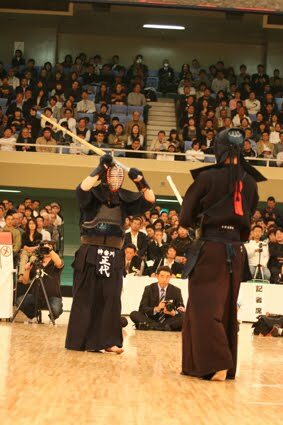 Kendo cannot be done by one person, but is the contribution of many people. So, no matter how successful we get in our kendo career, we must not forget the many people that have helped us from the beginning and along the way. Our Sensei have, so selflessly, pass on their knowledge and skills to us. For us in return, simple gestures like coming up to the Sensei after keiko and offering to pack their bogu and fold their hakama could be a way to show appreciation and thank them. Although this is small in return to the kindness that our Sensei has showered upon us, it is a way to practice and always remember our origin. The Sensei might kindly decline and say that they would do the packing themselves. But that kind of simple gestures and the humble thought, will be noticed by the Sensei. A personal story of Chiba Sensei. When Chiba Sensei announced his wedding with his Olympic medallist wife, the whole Japanese media naturally got extremely interested of this high profile wedding couple. The Japanese Prime Minister at the time personally offered to be the match-maker (仲人) of their wedding ceremony. However, Chiba Sensei kindly declined, and instead, asked the governor of the Nara Prefecture, who introduced him to his wife in the first place – to be the match-maker. Although many politicians and the media questioned why Chiba Sensei would decline such offer from the Japanese Prime Minster, Chiba Sensei personally felt that it was because of the governor of Nara Prefecture which has made it possible for him to meet his wife. So he chose to do this because he knew that he should not forget the origin (初心). Chiba Sensei was a left-hander, so he gave jodan a try and started practicing this kamae in his third year of junior high school. 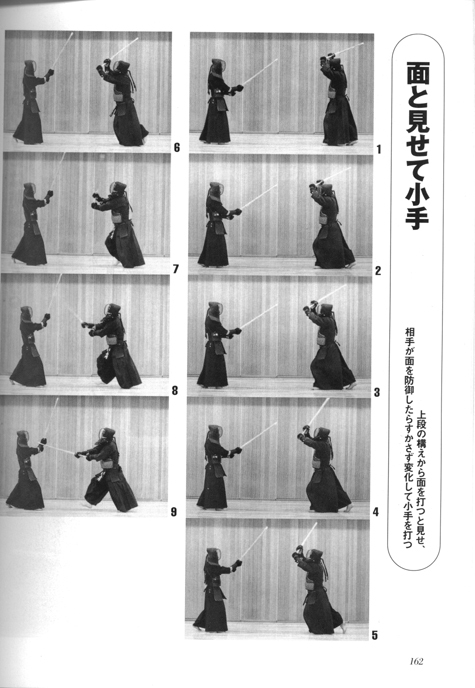 At the time, his jodan sensei would only show him the movements. There was never actually any teaching through speaking. His jodan Sensei was very tough on him. 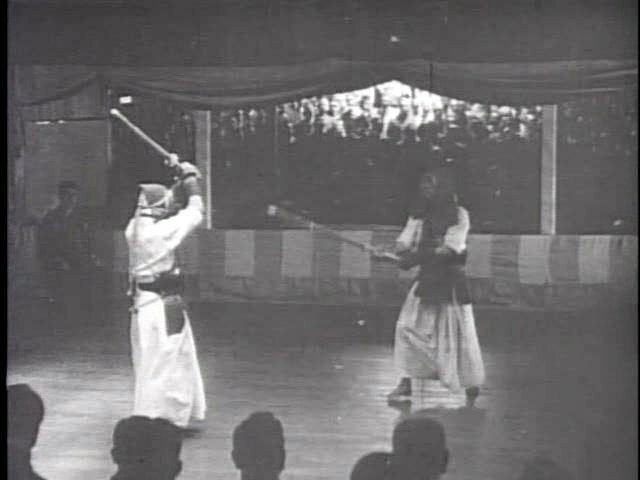 During practice, he would practice continuous katate striking practice, and his Sensei would knock his shinai out of the place everywhere, and made him continue the striking practice over and over again. 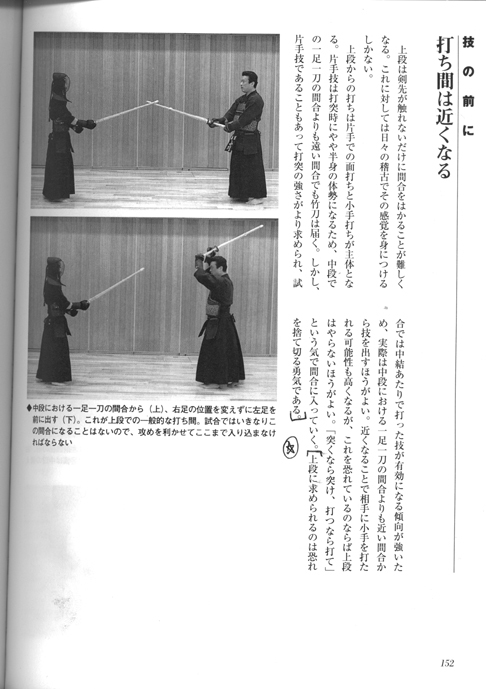 Chiba Sensei recalled one particular training session at the Tokyo Metropolitan Police Kendo Section. At the time, he was in his early 20s. His Sensei in the Police dojo asked the group to do shomen suburi without specifying how many repetitions. After 500, Chiba Sensei’s shoulders were starting to get tired, but his Sensei did not indicate the group to stop. After 2000, Chiba Sensei’s head was starting to get dizzy. However, it was only then that his whole body became relax from exhaustion that he found the right way to cut shomen. In the end, his group finished with 4000 continuous shomen. Chiba Sensei won his first Championships at age 22 – and since then, he has continuously placed in the top 3. In total, he won 3 All Japan Championships, and came in the top 3 numerous times. The media even coined a term for that period as the ‘Chiba Era’. The pressure from the media and the expectation for him to achieve was very high. So my friend asked Chiba Sensei how he coped with the pressure during that peiord. Chiba Sensei said that instead of thinking to win, which tends to tense up the body, he was thinking that he could not lose. 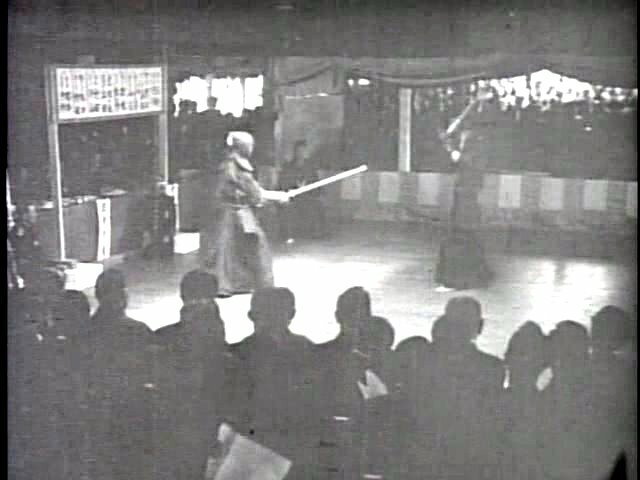 Due to the overwhelming success of his jodan in the kendo arena, rule was changed and mune-tsuki (chest thrust) was introduced as a valid target. This change of rule led to the demise of the jodan era. As we all know now, however, mune-tsuki is no longer valid due to safety concern. Chiba Sensei continuously emphasised the importance of mastering the basic chudan-no-kamae before learning jodan. 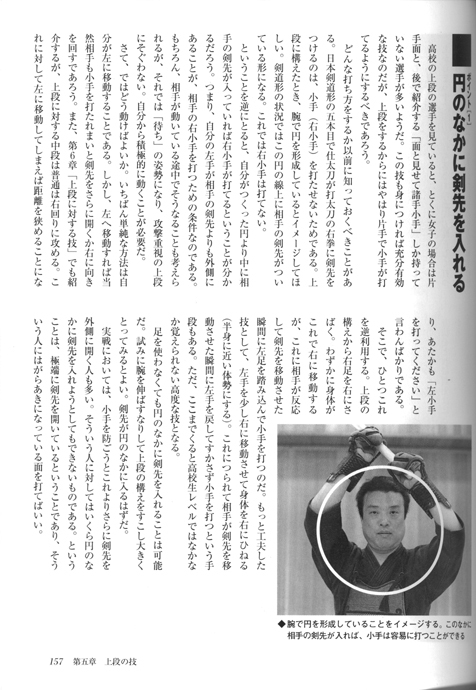 Back in his early jodan days, Chiba Sensei would still assume chudan-no-kamae at the beginning of each match. He would only change to jodan-no-kamae after he got an ippon. If you are contemplating to learn jodan, you must have the will to do 500 continuous katate-suburi every day. Yes, continuous. It does not matter whether there is a solid target to strike on or you are practice the strike in the air. If you don’t have the will to do this, then forget about doing jodan. Doing katate-men is like drawing the bow open to shoot the arrow – need to open up the chest. My left fist position in chudan-no-kamae was too low. Chiba Sensei adjusted my left fist to a level left to my belly-button, and about one fist distance to the front. I could instantly feel that my shoulder and grip were more relax in this arm position. The action to execute men-uchi from this kamae is like punching both fists out. The gripping strength of the right and left arms should be about 30:70. More with the left and less with the right. Only the last two fingers of both hands should be gripping the shinai. The middle finger should only be gripping with the shinai with smaller force compared to the last two. And the thumb and index finger should be completely relax. Chiba Sensei suggested us to practice doing tenouchi 50 times a day. When doing men-suburi, we only need to bring the left fist as high up as just above the forehead. There is no need to lift the fists any higher than above the forehead as that will end up as wasted movements. A very good analogy for the men-uchi cutting motion: execute men cut as if you are throwing your wrists away. 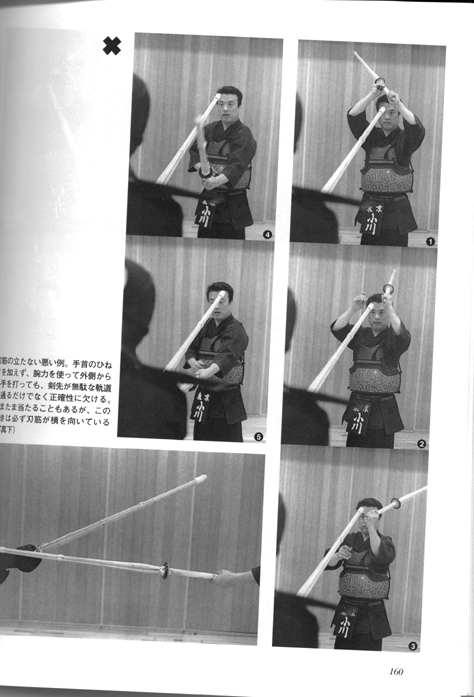 To teach people how to strike men properly, Chiba Sensei suggested to grip the shinai (both hands) to the very bottom of the tsuka. That will teach the students to extend and straight both arms (no flaring elbows). 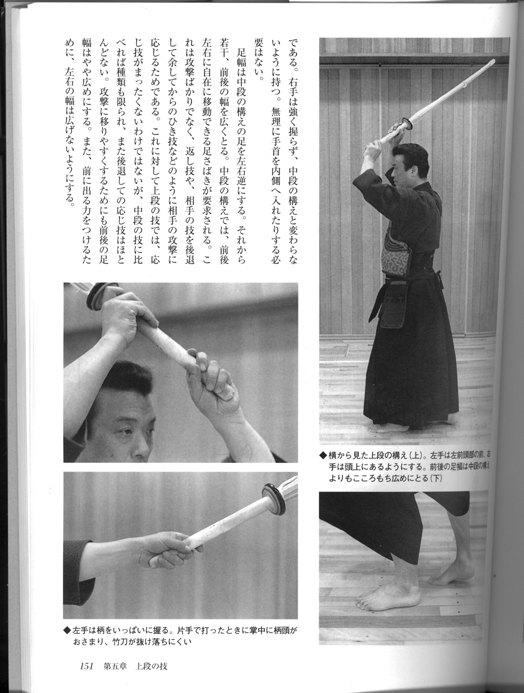 Once they can execute this motion correctly, normal shinai grip can be resumed. 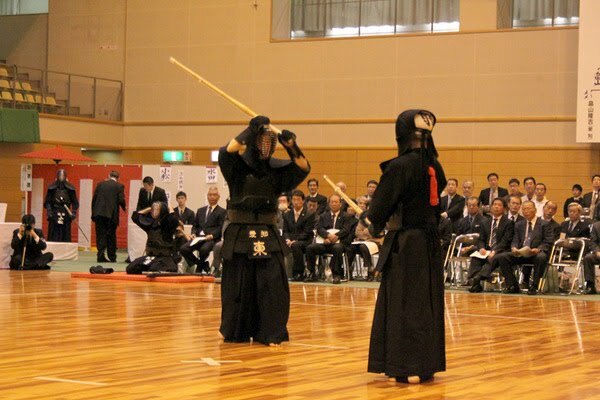 As far as police-based kendo is concern, there is no such technique as sashi-men. A good men cut must consist of a strong wrist-snapping action to strike the target. Sashi-men is more a high school technique which relies on speed. 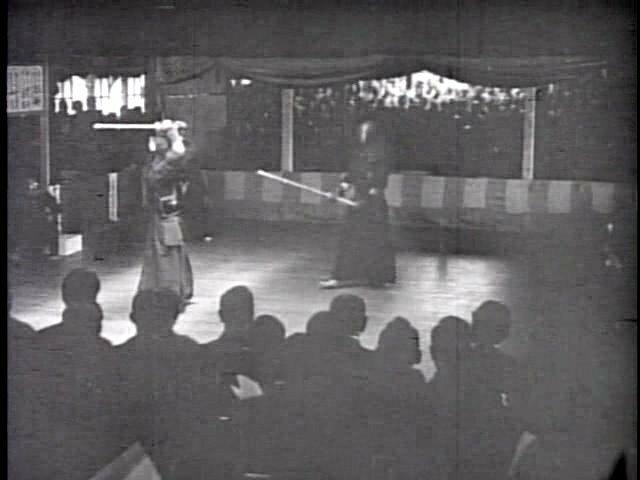 To strike a good men cut with strong seme, hold the kensen to the opponent’s throat level, and execute the wrist-snapping action at the final moment to cut men. Cut at 45 degrees, otherwise, the sword will bounce off due to shallow cutting angle. After cutting kote, the shinai should be in a position such that you are in a good position to cut men immediately if the earlier kote cut failed. Motodachi governs the speed of action, so motodachi has an important role in controlling the speed and distance of the exercise. 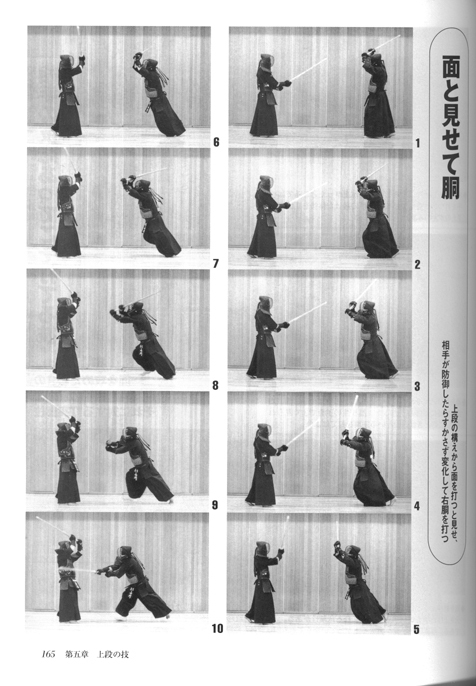 Remember, kirikaeshi is a pair exercise. Chiba Sensei suggested to leave taitari out of the kirikaeshi routine until one has mastered the basics and become competent in doing taitari. Obviously, putting on the bogu correctly is very important. However, we must also practice putting them on quickly. Chiba Sensei suggested us to do wrist warm-up exercise by striking targets in an angle. For example, sayu-men and do on both sides. This will loosen up our wrist and will allow us to make more dynamic striking movements. Remember that the shinai represents the sword. If we practice by aimlessly hitting and whacking the shinai in the hope of landing the target, this would have make a real sword chipped or bent, and one would not be able to use the sword for long and the sword would probably be too bent to put it back into the saya. So always remember to cut as you would cut with a real sword. 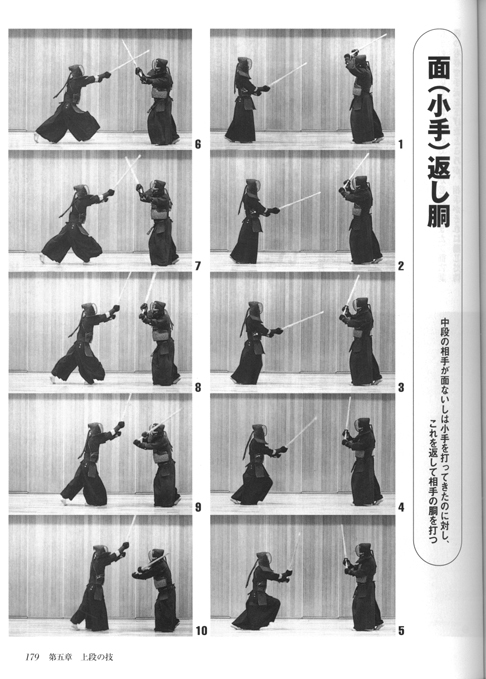 In Kendo, one can only improve through continuous repetitive training. To become better than the rest, one must train harder than the rest. 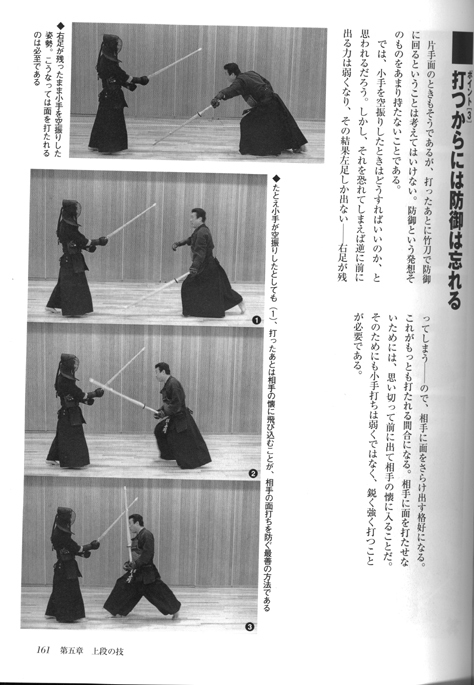 Both Chiba Sensei and Oda Sensei have practiced to the stage where they can execute a cut without plan – mushin. A subconscious reflex that only after they made the strike did they realise what they have done. One can strive to reach the mushin stage once the basic concepts and movements have been mastered. 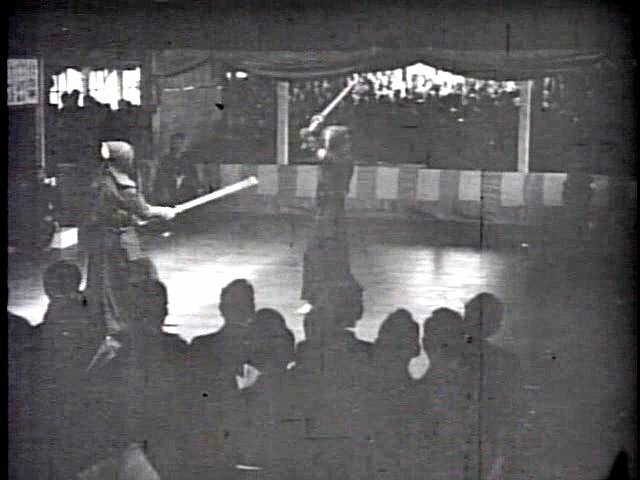 Kyu grade kendo does not count as mushin as their kendo repertoire is still relatively empty and cannot be called mushin. So mushin, as Chiba Sensei said, starts from ‘Square one’, and not from ‘Square zero’. First 2 minutes: continuous attack. Next 2 minutes: lure your opponent and trap your opponent into attacking a specific target, ‘come on, come on’. Once your opponent take the bait and go for your intended cut, you can practice execute the counter cut. Final minute: allow the your opponent to strike continuously. Who would have thought that Chiba Sensei is so good at massage. Me and some of my lucky friends were able to experience the magic hands of Chiba Sensei. Due to some mis-interpretation, Chiba Sensei and Oda Sensei thought that I am studying massage instead of physiotherapy. And so, they have been asking me to give them a massage. So I had to find my friend to teach me the correct Japanese phrase, so that I could explain to the Sensei what I was actually studying. Anyhow, I did actually do a community massage course a few years ago, and so I shamelessly offered Chiba Sensei a massage. After about 10-15 minutes, when I finished giving the back, neck and head massage. Chiba Sensei indicated to me to turn around and seiza. And he started pressing on the pressure points on my back and neck! Suddenly, he held my head in place with his hands. And ‘clack-clack-clack’. He twisted my head to the left in a quick, swift, snappy motion – the kind of motion you see in action movies where people finished off their enemy in hand-to-hand combat by twisting their neck… O_0. Then Chiba Sensei tried to twist my head to the right too. Naturally, my neck tensed up because I was still shocked from the first twist. ‘Relax’, he knocked on my head. ‘clack-clack-clack’. He twisted my head to the right. Chiba Sensei then asked me to try turning my head. Oh, it felt so smooth. And incredibly, my head’s range of motion have increased substantially, restored back to normal. I have had some kind of neck motion blockage for quite some time, and sometimes, it has contributed to neck pain. But Chiba Sensei has fixed all that in one go. Okay, two twists. It was like magic. So, after fixing me up. He proceeded to fix 3 of my friends. We all felt strangely good after the click-clackings. Chiba Sensei said he learnt these techniques from his judo-seikei friend – who specialises in fixing judo-related injuries. He said he always goes to his friend to get his body fixed before major competitions. I asked him if it was scary to try to do the head twist on another person at the first time. haha, he said ‘of course’! But now, I think Chiba Sensei is really enjoying twisting other’s head. The next day when I once again thanked Chiba Sensei about the massage he gave the previous day during yum cha. He was so happy and went up to the yum cha trolley lady, and cracked her neck too. It was purely hilarious. The yum cha trolley lady was so grateful she kept thanking the doctor. Chiba Sensei said he might come to Sydney again next year, so if that’s the case, he will come and crack her neck again. haha. What a joker! 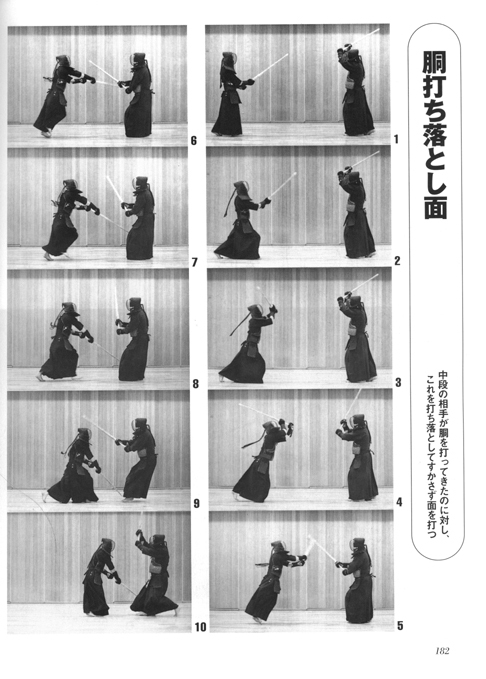 Note that both 8 Dan Sensei have big bump in their elbow due to repetitive trauma (ossification) to that region throughout their kendo career. But I think the 8 Dan Sensei are pretty proud of that. 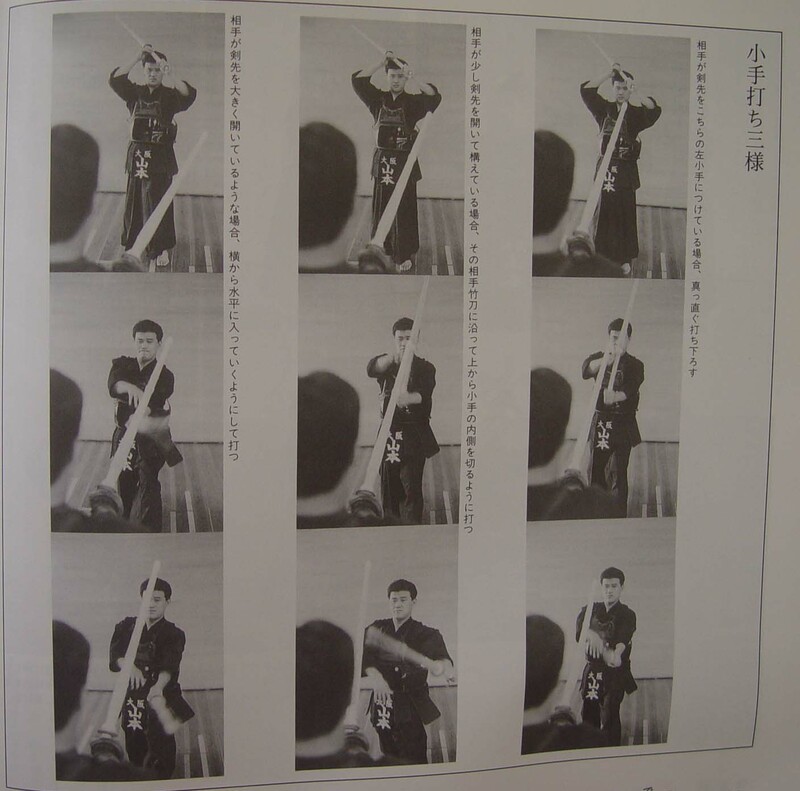 Also, apart from being a sword master, Oda Sensei also holds 8 Dan in a different kind of jodan (Jokes in Jpn = 冗談 or ‘joudan’). He has been constantly throwing out Japanese word jokes throughout his visit in Sydney. And btw, he is also a curry master too, according to Chiba Sensei. Anyway, that was my exciting time with the two great 8-Dan Sensei. As my friend puts it, it was like receiving private tennis lessons from Roger Federer. 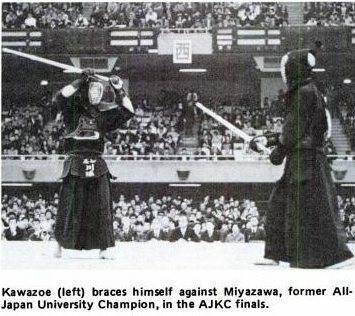 Taking the crown three times at the All Japan Championships, at the height of jodan’s popularity Chiba Masashi sensei was the competitor who shone most brightly of all. We asked him to tell us what points to be mindful of, as well as those techniques, unique to Chiba sensei, that have been born from his experiences up to now. Train in both chudan and jodan! Even Chiba Masashi sensei, one of the best known jodan masters in the country, has recently mainly been practicing in chudan. Chiba sensei took up jodan himself when in his third year at high school, and even then, only to the extent of using jodan after going a point ahead when in shiai. 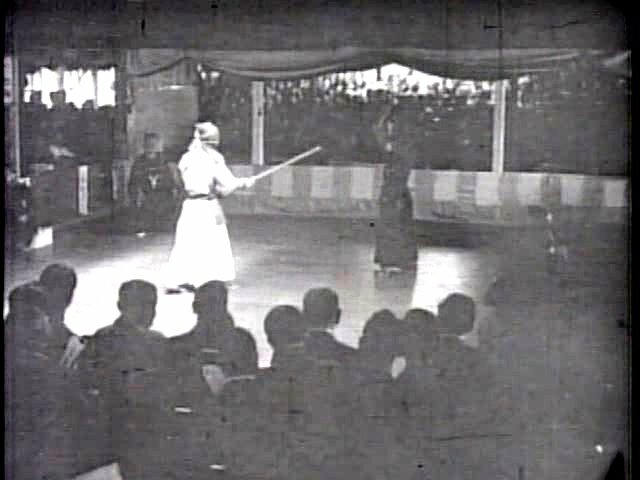 However, in recent times the number of competitors taking up jodan soon after entering high school has been on the increase, and there is a tendency to see this as, to some extent, an unavoidable symptom of current high school kendo. It was in his second year at Tokyo Metropolitan Police that Chiba sensei started seriously using jodan. The glittering achievements that he has left since then need hardly be mentioned, but even then he did not train in jodan alone. In fact, Chiba sensei has taken all of his gradings in chudan. 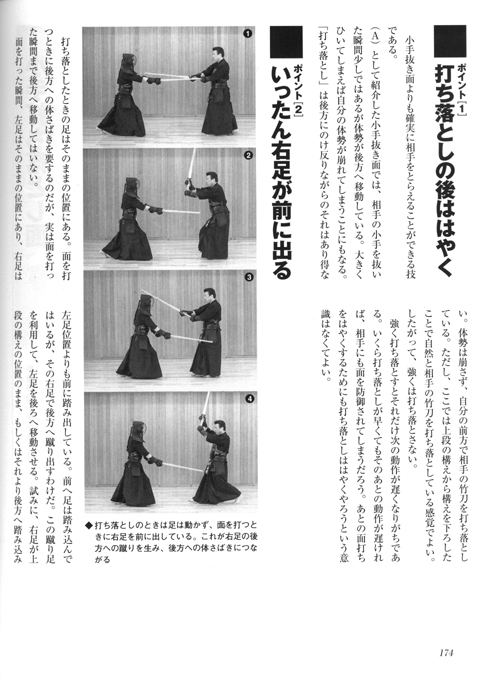 Learning jodan is after all an essential condition for somebody training in kendo. People taking up jodan lightly is a concern, but inadequate instruction of jodan is also a problem. In some universities there is not even a single jodan instructor. In this kind of situations it is normal not to know how to go about learning jodan. Incidentally, it is common knowledge that due to the recent match and refereeing regulation revisions, munazuki against jodan is no longer a valid point. When Chiba was active in the likes of the All Japan Championships, at the height of jodan’s prosperity, there was an air of ‘as long as you take jodan, you’ll win in shiai’. As a measure against this, munazuki against jodan was added as a valid strike, and jodan’s glory days came to a sudden end. So does this mean that these revisions will bring another jodan era? ‘Even if you decide to take jodan, if you don’t know how to swing down the shinai it will come to nothing,’ says Chiba sensei. Leaving how to swing down from jodan, in other words techniques from jodan, to later pages, we asked Chiba sensei what kind of things he did as training methods for jodan. Chiba sensei’s ideas on keiko are of great help, and not just for jodan and chudan. ‘I’m often asked how many hours I practice, and I always wonder “why?” in disbelief. We always practice based on content, so in the hot period of summer twenty minutes can be quite enough if you go all out, and conversely, those people who can go for two or even three hours are able to do so because they’re just playing. Accordingly, it’s not time, but what tasks you assign yourself that is important. If we use jodan as an example, you might say to youself that today, no matter what, you will match everything with degashira waza, or that no matter what you won’t allow your opponent to thrust, or that you won’t mind getting thrust at and will definitely not break your stance. Even now, Chiba sensei says that he takes jodan when he has the opportunity. He says that, just as with chudan, his jodan kendo has changed as he has grown older. Chiba sensei practices a great deal, and within that practice has clearly defined objectives. It is no exaggeration to say that he has a full understanding of how to fight from both jodan and chudan, and will doubtless continue to further develop his techniques. 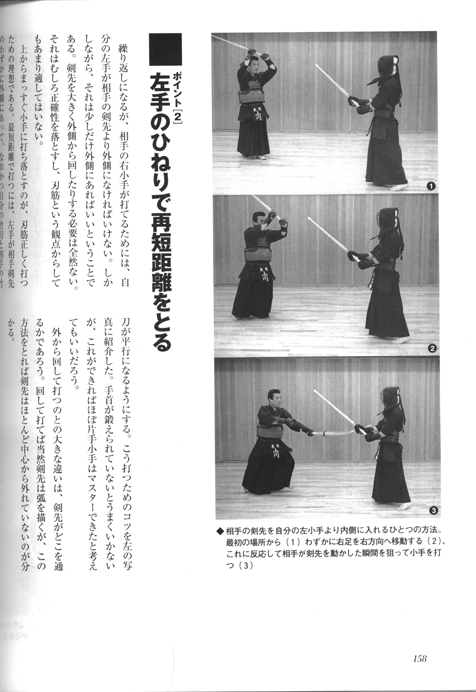 The right hand, not just the left, has a major role to play in using one-handed techniques from jodan. 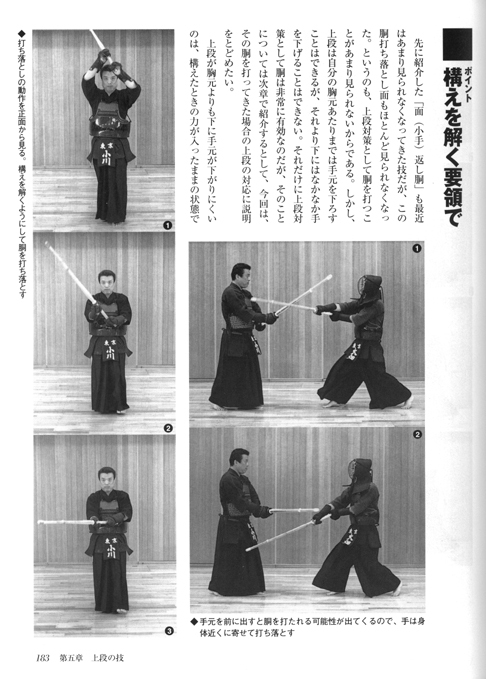 Chiba sensei decisively places his right hand at his right flank, simultaneously striking with the left hand. He says that a firm strike can only be achieved with a strong drawing in of the right hand. It is normal to place the left fist slightly above the left eye, about a fist’s separation away from the head, but Chiba sensei does things slightly differently. He places it in front of the left eye, about two fists’ distance away, sayin that this makes manouevering the shinai go more smoothly. According to Chiba sensei, this position allows, for a start, smooth avoidance of kote strikes. Also, since the left hand is further forward than normal, rapid strikes are possible. Since it is easiest to strike after building tension in the left knee during seme, Chiba sensei distributes his weight about 60-40 over the front left foot. In order to stabilise the body when in jodan, Chiba sensei places his feet ever so slightly further apart than in chudan. 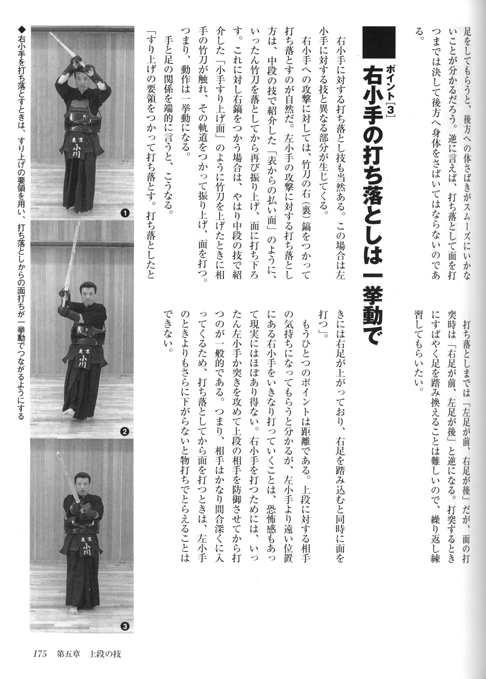 Although a slightly different topic to his kamae, Chiba sensei also has his own unique ideas about seme from jodan. 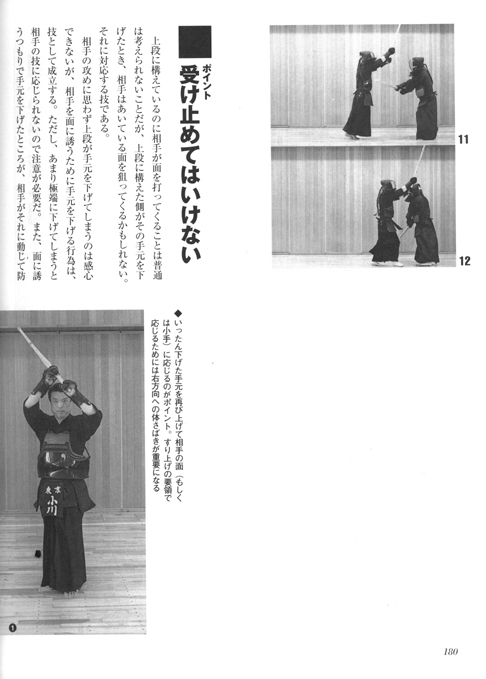 Just as the kensen is used to suppress an opponent from chudan, Chiba sensei believes that in jodan the tsukagashira should be used to pressure the opponent. By doing this actual strikes will also become faster. 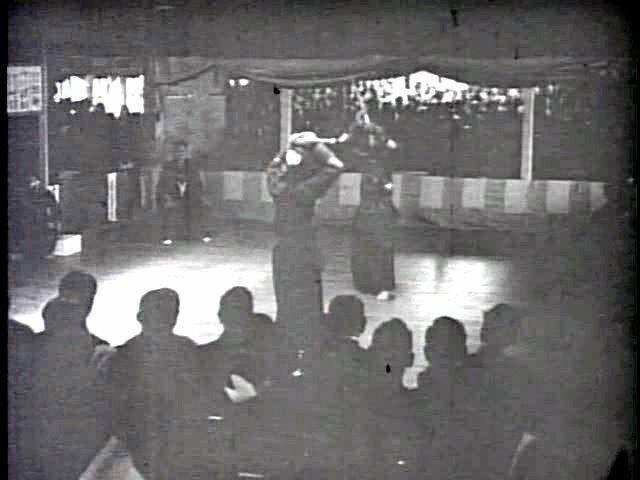 It is common to see people gripping with the left hand slightly in from the tsukagashira, but Chiba sensei grips the very end of the tsuka. In fact, he says that it is better to have the little finger half off the tsuka, feeling from his experience that this makes strikes more rapid. The right hand is merely placed on the tsuka, and does not grip tightly. Chiba sensei says that a tsuka width such that the third finger touches the palm makes a number of techniques easier to use. Go thicker than this, and big techniques such as tobikomi men become easier to use, but subtle tehniques become more difficult. He feels that this thickness is also just right when it comes to snapping the wrists and adding power to a strike. When it comes to tsuka length, the norm for a chudan shinai is about 3.5 fist lengths, but for jodan something slightly longer, about 4 fist lengths, is better, says Chiba sensei. If you try holding a shinai with an excessively short tsuka and then take jodan, you’ll clearly see that you end up with a cramped stance. Accordingly, if you do the opposite and use a long tsuka, you get a comfortable stance with some depth. It’s easy to pressure an opponent as you can suppress them from above when you seme. 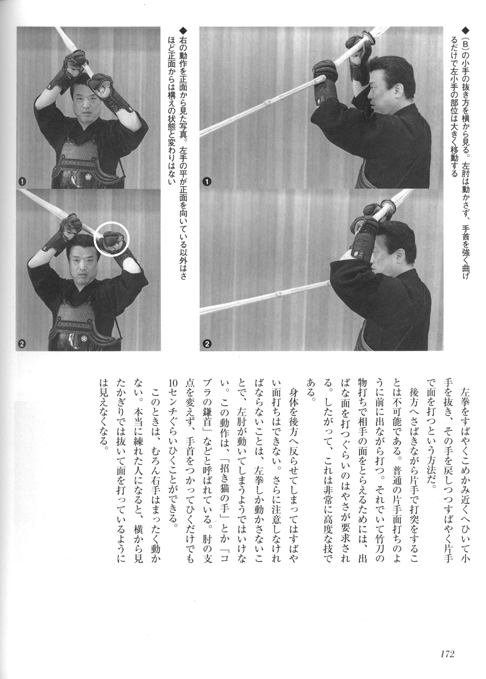 Chiba sensei also feels that it is effective when close in and, for example, when striking kote with both hands. The left hand grips the tsuka with the little finger half off the end. The right hand is placed lightly on the tsuka. 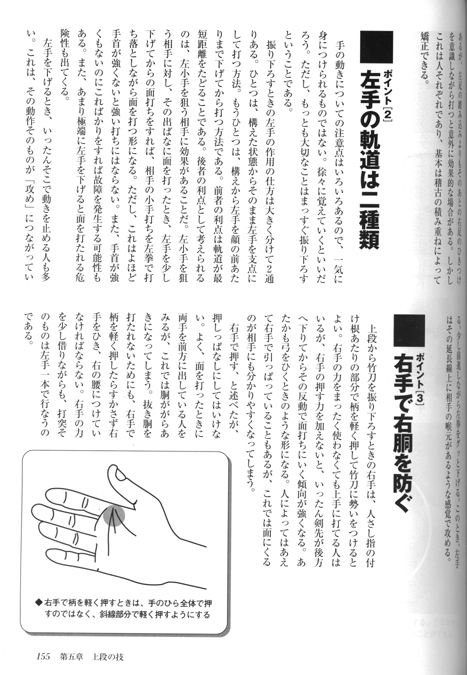 Based on his experiences, Chiba sensei says that a tsuka width such that the third finger touches the palm of the hand allows delicate shinai handling. 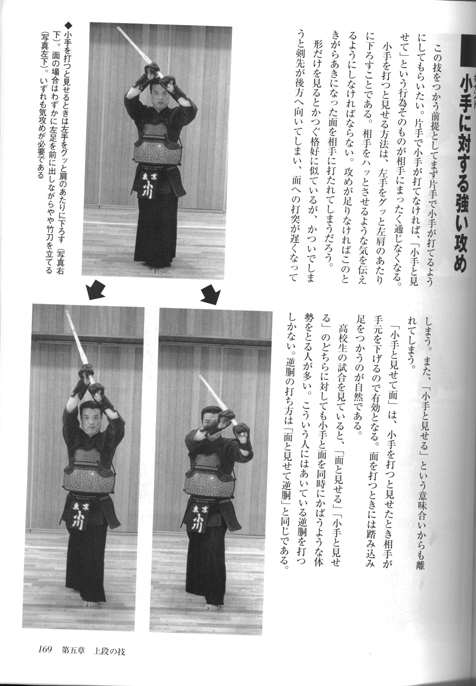 By placing the left hand in this position, shinai handling becomes smoother. Strike with the feeling of thrusting your left hand into the opponent’s throat. Hit men with the intention of thrusting at the opponent’s throat with your left fist. Strike kote as if jamming your left thumb into their kote. If you hit kote with the intention of jamming your thumb into the opponent’s kote, your strikes will be sharper. 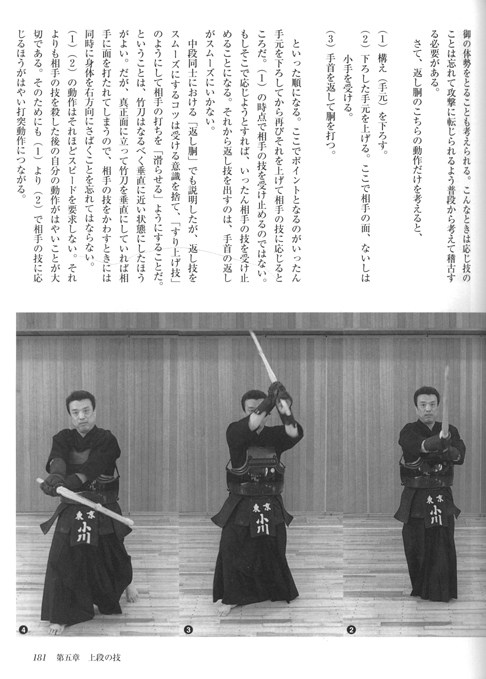 The path of the left hand between its position in kamae and at the time of striking is a straight line. If it describes an arc, the kensen also takes the long way around to reach the opponent’s men. In Chiba sensei’s case, he strikes men after first firmly thrusting the left hand forward. Consequently, his whole body stretches like a rubber band. 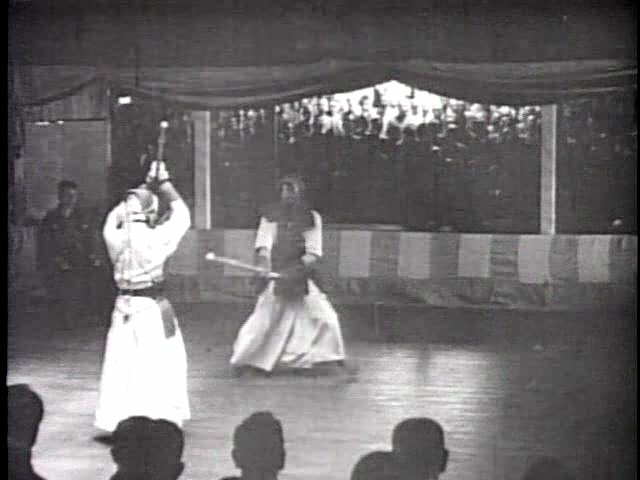 If you swing down at their men in the same fashion as when doing suburi from chudan, you won’t produce much speed, and since your body won’t extend sufficiently, you’ll be forced to use a closer maai. – If you are contemplating to learn jodan, you must have the will to do 500 continuous katate-suburi every day. Yes, continuous. It does not matter whether there is a solid target to strike on or you are practice the strike in the air. If you don’t have the will to do this, then forget about doing jodan. – Doing katate-men is like drawing the bow open to shoot the arrow – need to open up the chest. Unless you master this method of taking men along the shortest path, you will not be able to take advantage of an opponent’s weaknesses and strike them. Kanaki Satoru 8 dan kyoushi’s view. When Kanakisatoru, passed his 8th dan test using chudan. This made him think about taking jodan again and looking a little more deeply into it. Every practice he started taking chudan for 7 minutes then going into to jodan for the remaining three every practice. He has been doing this for 5 years now. He says ‘I can see the problem but I still can’t put my finger on it…’ Kanaki Satoru takes this study and explains the jodan techniques he has kept to him self so dearly. Cut in a circle from the tip! When I was in the second year of university (Tokai-university) I was transferred to the sports science and budo department. The senseis Iue, Hashimoto and Koyanagi were all teachings there at the time. Although I was in the kendo club my schedule got in the way, so I couldn’t train with these great teachers. I really wanted to try and get the most out of my training so I asked for a transfer. When I was at high school (Tokai-university No.4 campus) there were few teachers and this had a great effect on me. The first time I thought about taking jodan was the fall of the second school year. It felt so sudden. One day Iue-sensei just said ‘Lift it up!’. Not really such a theoretical explanation but he said ‘Feel like you are taking very large stance’ and ‘Cut a tire cutting like you want to cut from the belly button 3000 times a day’. So I started to cut the tire as he said. I practised from noon until 1:30pm every day. It was impossible to cut the 3000 cuts. I only just made 2000 (laughs). The seisei said ‘Well how’s it coming along?’, I said ‘Yes I’m doing it all well’. So what about foot work? That was down to kakari-geiko. And I was to practice first with Iue-sensei every day. Then one year later I won the Akado championships and then the club championships. This was out of 140-150 students. It even surprised me because before I had continuously loosed all of the time. Its natural to have lost 50 times in jodan. I just couldn’t seme correctly, my distance didn’t work and I couldn’t see a chance to cut. I just didn’t have it at all. The thing which turned it all around was when Mr Hashimoto said ‘cut sharply (use tame [see bottom])’. When your opponent just stands firm and even performing seme wont make him move. Hold it and when he comes at you hit him without a thought (naturally). What I had in my mind was that jodan was about, just getting one cut. I failed because when I took jodan I just cut when the opponent frightened me into cutting..
Don’t rush into cutting, take another good look and prime for making a cut. This is really difficult although you can say the same thing about chudan. All the more difficult is making an opening. Even said, I felt I realised some thing at the time. After I won the Akado championships I continued to hold the top position. I felt if I hadn’t have taken jodan it wouldn’t have done me so much. 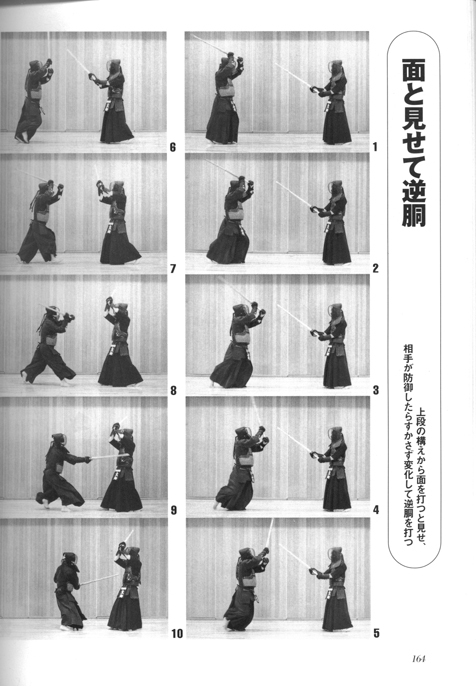 But for me jodan is altogether a difficult and and enjoyable part of my kendo. In one word just as Inue-sensei said ‘Just lift it up’. I really admire Inue-senseis teaching. I’ve practice jodan up to my 40s and then chudan. At my 8th dan test I preferred chudan. I passed in November 2000 and decided to take up jodan again. To me the 8th dan great was a turning point and after that I wanted to work on jodan. I’ll practice chudan for 3 minutes then jodan. But in competitions it’s jodan. Iue-sensei said. Every time I see the large Mt’fuji and rivers flowing, this is what I think of when I take jodan, its got to be large. Your stance should be as if you were wraping around your opponent with all your energy. Although when you attack your opponent use small movements and hold your stance. Call on your energy when your opponent attacks you. Never break your stance and have the feeling that there is a chain lifting your spirit high up. Cut only when you see your opponents (true) intentions. Altogether jodan is hard for people who want to take it up. Well that part was a bit too long. Next we’ll move onto cutting the tire, cutting, seme and techniques. Of course I started jodan from cutting the tire,. and it had a huge effect on my jodan. 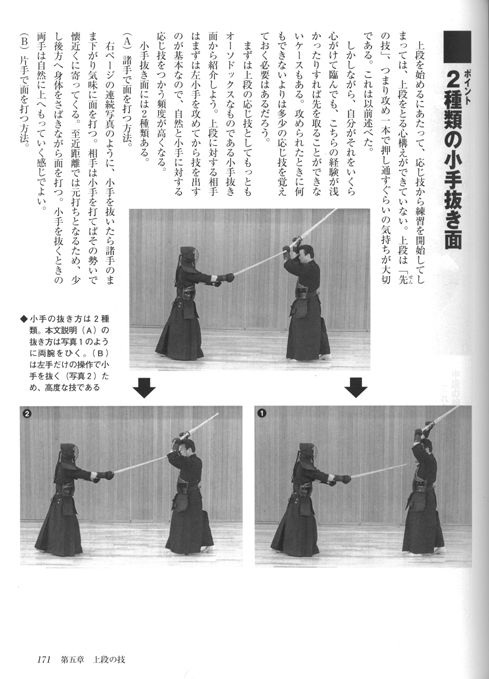 Left jodan (Hidari jodan) is almost always performed with just one handed strikes so to score, it has to be fast strong and with cuts performed sharply. This was Iue-sensei’s intention when he said ‘Perform the tire cutting 3000 times a day’. I was cutting frantically at first but the speed just didn’t come out. So I thought hard about what to do. I tried forcing my right hand down and at the same time pulling my left hand in. And then my cuts made a strong ‘don’ sound, I thought I had it. The tire practice has a lot of advantages: It adds speed to your cuts, of course it makes you stronger, the moment you hit the tire try to tighten your hands. When you realise how to do this your grip technique will improve and a sharp and accurate cut will come. So when you cast your right arm forwards there’s no point in leaving your left arm dead. Although your point must draw a circle as it falls down. All in all, I think it should be a cut which does not show when it is going to be performed to your opponent. Now we must think about the difficult points, when we cut men its fine, but not being able to perform kote is always some thing worrying. Even for me. A jodan player who is good as men also must also good at cutting kote. Men is good when the left fist is pointing to the left. Its not a mistake to believe that kote is the strong point of jodan when the left fist is pointing back, or the palm is facing the opponent’s kote. When I practice on the tire I exclusively hit men, so my fist is always pointing to the left hand side. Kote really isn’t my strong point (laughs). Next we will talk about seme, when two shinais do not cross it naturally becomes an attack (seme) from the mind. Most people say seme from the left fist! when doing jodan. Obviously this kind of seme in jodan is common. But in my case its different, I try never to move my left hand at all. I hear you asking, where do you seme from then? The belly button. Seme by thrusting using the belly button. Although this make you unintentionally drop the left fist and twist your body. But do the opposite, keep the shinai over your head and strongly push forwards with your belly button without any delay. This is scary but even so over come the fear and step forwards even just half a step! If you have to hold your ground, remember seme is both attack and defend at the same time. And when you push out with the belly button, all the tension moves from the upper body to the stomach and your body becomes more relaxed. Cutting becomes no problem and your cuts flow smoothly. This is what I try to work up to but it still hasn’t come to me yet. I want to say one more important thing about seme that relates to the time when you go into sonkyo and the time when you stand up. When I go into my stance I bring my left foot forwards and go straight into jodan. Take the first move (sen) that’s what I have in my mind all the time. So my conclusion is to take the initiative. If your opponent takes a steps back or moves to one side. This makes me think that my opponent will attack (seme) relentlessly and try to brake my technique. 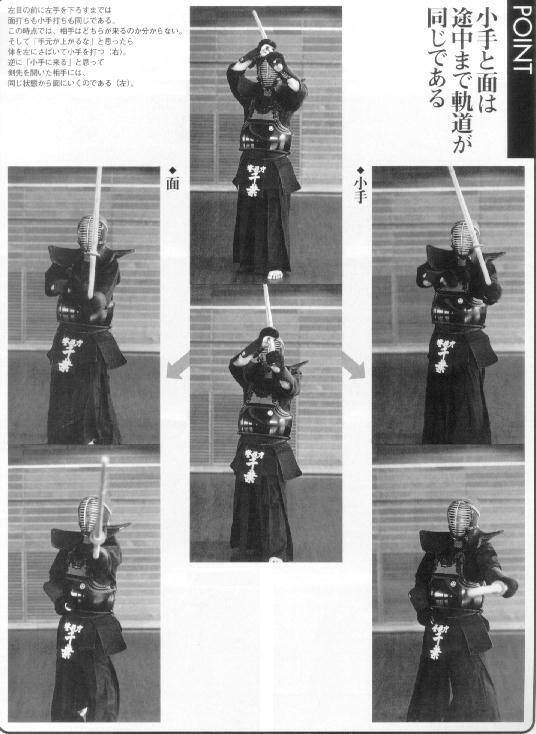 Maybe its just natural for him to move back or forwards, but I think its one of these things you must get a feeling for in kendo. Although the techniques are always men there are actually two ways to perform it. To cut straight down, or reach out and cut men. When you manage to take debana you must have the speed to be able to cut straight away. This is for the down cutting (spot cut) type men. If you are doing the seme andw your opponent steps back trying this down cutting type of men will lead to tip reaching (dropping). Because this cut follows a fast circular line just hit mid air. You have to bring your elbow in and at the same time let your elbow drag your body forwards. This type of cut is best for this type of opponent. This cut is called the extending men cut. Although these two techniques are the same you really have to think about when to let go with your right hand. With the (spot), down cutting men you let go when your hand is in front of your eyes. I still practice cutting the tire now and again and whenever I do, I always try to practice both types of men. Still there is the kote cut with both hands but I unexpectedly scored a single handed kote in one shiai and I am not good at single handed kote. 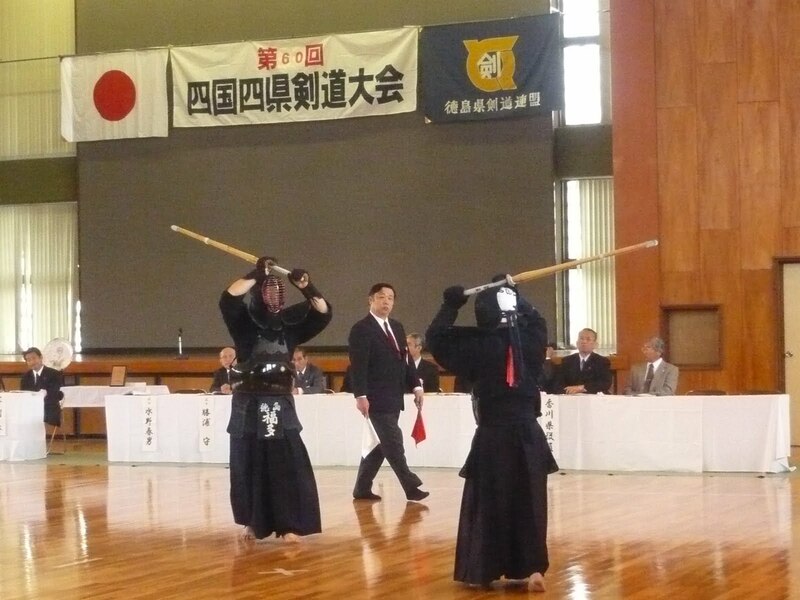 I even scored one kote at the Shizuoka kokutai competition. If the opponent lifts up his kote when he tries to use tsuriage men (catch men) or leaves his kote in the air, this is the time when you have to swiftly cut his hand. Just like in kata number two. The thing is when cutting the tire just tighten the grip when you hit the tire and then loosen it. You can tell that I prefer to cut debana men. If the opponent stays still I just cut extended men. Pay great attention to your opponent’s techniques and use your mind and think about distance and at the same time try to cut him. 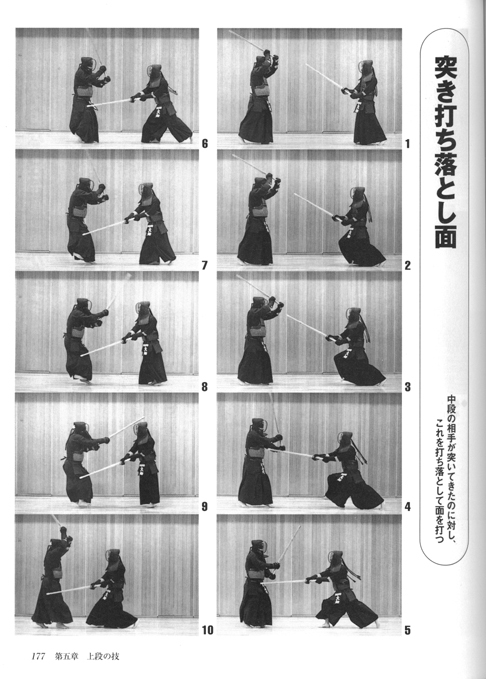 I think this is the kind of kendo I am working towards. – Attack (approach, not actually hit) the left kote and then hit the right kote. – Attack (approach, not actually hit) the right kote and then hit the left kote. – Attack (approach, not actually hit) tsuki and hit the left kote. – Attack (approach, not actually hit) tsuki and when the guard is lowered hit men. – Feint right kote and hit reverse do. – hitting degote in respones to any two handed technique. The right player in jodan is Takasaka Yosuke, 3rd place at the 59.AJKC. This match is interesting because of the tactics of his opponent who doesn’t let him execute mostly any waza and always goes in to close distance. At the end Takasaka finally wins with a morote men. “I have seen few thread about fight against Jodan. But can anyone give me any kind of advise about what is the most effective way to fight against Jodan ??? Where should I hit ? Left Kote, right To and Men, right ? Everyone’s got good answers and their probably all correct (depending on a lot of circumstances)! 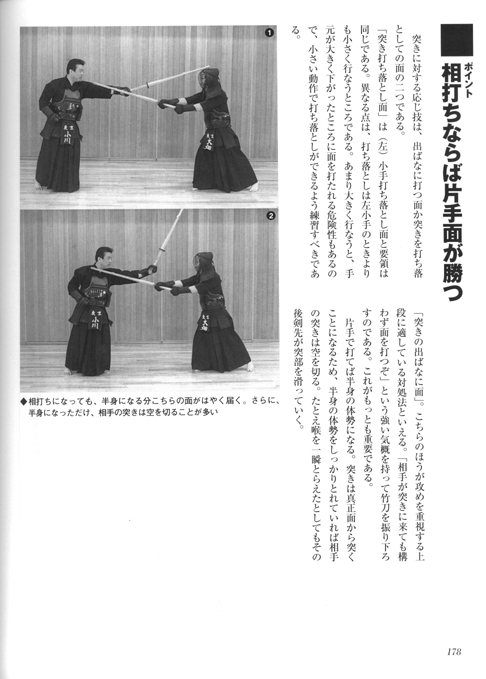 In a Japanese Kendo magazine, “Japanese Kendo Monthly” Jan.2003, there is a pretty nice article where two Kanagawa Ken Police, Miyazaki Masahiro Sensei (5 times All JapanChampion) demonstrates attacking hidari jodan, with Shodai Kenji Sensei (Kanagawa Ken Police Champion 2002/who made final 16 All Japan Tournament) at 22 years old in 2002 or 2003. Shodai Sensei uses hidari jodan. 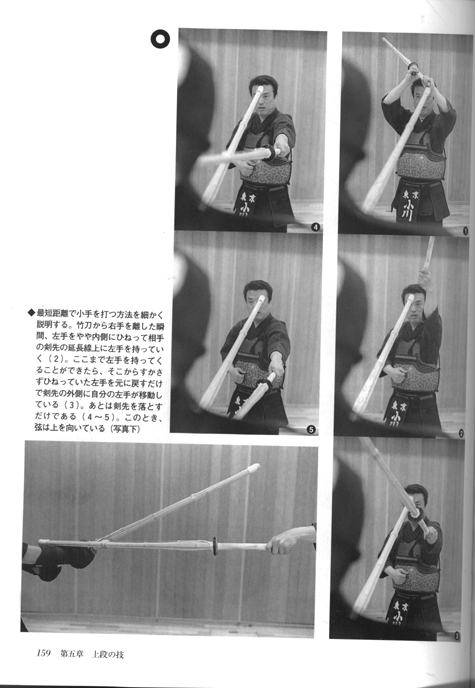 Miyazaki Sensei uses a modified Chudan No Kamae pointing to the left kote of hidari jodan. But In this position you are not showing your kote. It’s also a little different from the 5th kata, because he doesn’t raise the shinai when engaging against hidari jodan. 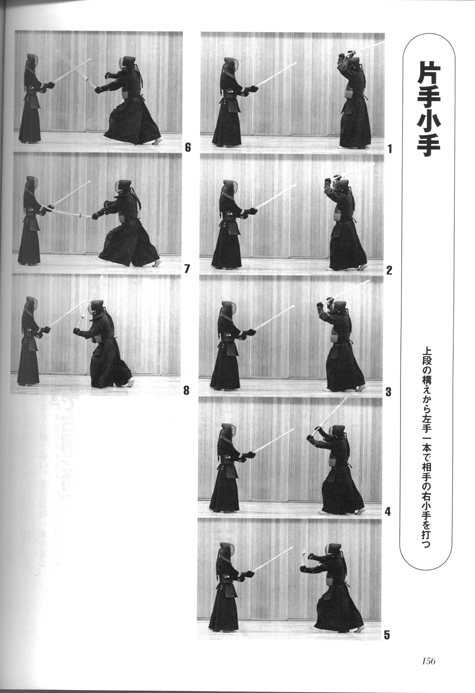 From this position, Miyazaki Sensei attacks hidari jodan’s left kote or migi do. I personally found out (practicing with Shodai Sensei) why you should never raise your shinai to the right when playing a great hidari jodan player: you are practically inviting him to take your kote. Shodai Sensei Taught Me Not To Do It/ And completely persuaded me. This was before I saw Miyazaki Sensei’s correct way). In fact very good hidari-jodan player wants you to raise your shinai to his left kote. Also I saw a young 8th dan playing against another Top-Gun hidari jodan player. Basically whenever he was in range, he attacked hidari jodan; he kept attacking. So basically, if you are in range you should be attacking. 8th Dan Sensei attacked with kote, tsuki, and do. He never counter-attacked.In fact sometimes he just stayed in a very super correct chudan no kamae and when hidari jodan attacked, he was met with tsuki. Just naturally ran into it. The second way(that I have observed) is to confuse and then attack. When I have time… Oh well, this feeling> Am I here ? Am I there? Am I in range? out of range? Keep Moving! Where is my shinai? In my left? In my right? “Yes, there are different types of one-hand men. As far as I know, more than 5. On training of men, we have to pay much attention to movements of left hand. If your left hand goes just forward, so your men is big men, on the contrary, if your hand goes down and up, your men is small men. If your hand goes like punch of boxing, it’s a professional men. Sure, there is one-hand kote men, and it must be a good exercise for your tenouchi. But actually it is not available in tournaments. 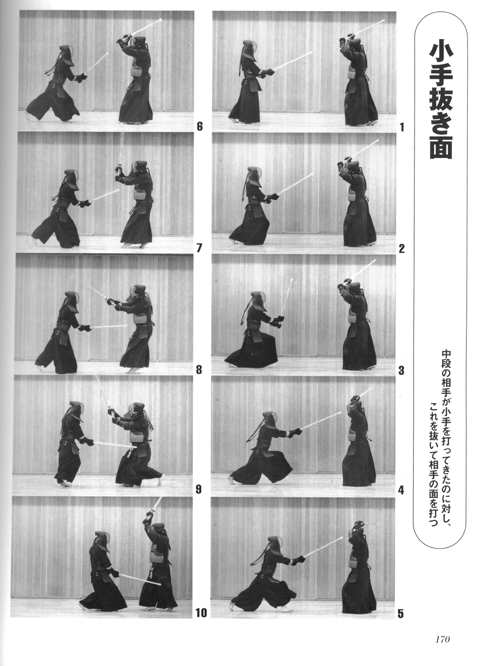 Concerning to one-hand kote, also there are many many types in modern kendo. First of all, straight kote, secondly “S” kote, thirdly “C” kote, fourthly “90 degree” kote. They are just typical ones. In any case when you practice one-hand kote, don’t go left, just go straight. If you go left, you can see your partner’s kote very easily. 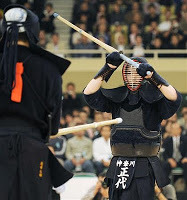 However I believe, that your purpose in Kendo is not victory, but self development. For that purpose, strong spirit “ki” or “kiai” are necessary. If you go foward with strong spirit, automatically your partner’s kote will be opened, and you can strike. I want to say again, that ourr purpose is not getting effective ippon, but getting stronger and quiet spirit and mind in order to be better man. Just go straight.” S. T-K. 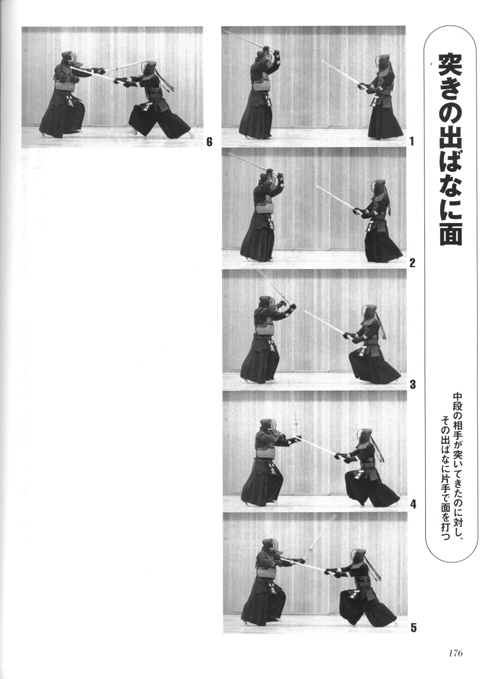 I wonder, do you have JODAN NO KAMAE BASICS pictures in high resolution or in pdf format? With your premission I’d love to translate it into Russian for Russian kendo community, but I can’t make out some complicated kanjis (while zooming it becomes blurry). If you got ones, please send me via email. 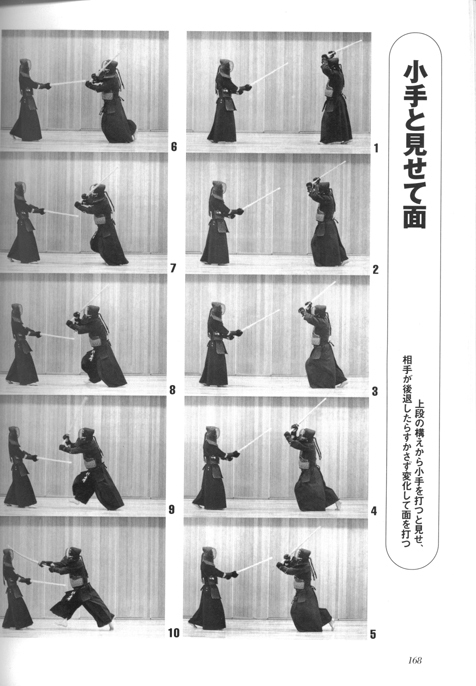 Or at least the source of this article in Japanese, so I could buy it online. I’d be most thankful! Have a nice day!